Donald Trump has lit a fire under the global gold market. 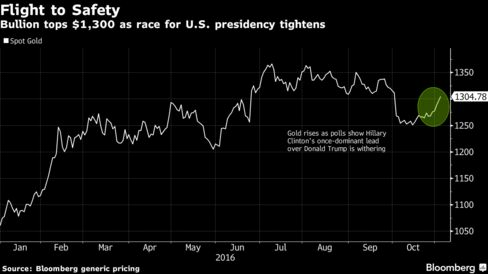 Bullion rose for a sixth straight day as the tightening U.S. presidential race spurred a jump in haven demand, with investors seeking out protection in their portfolios against the possibility of a victory for the maverick Republican candidate even as the Federal Reserve sent a signal that rates will soon rise. Investors are seeking to navigate the crosscurrents thrown up by the U.S. poll that’s due next week, with a possible victory for Trump buoying bullion prices amid concern that his presidency risks a global trade war and may hurt growth. Gold’s advance has unfolded as the U.S. central bank prepares the ground for a hike next month, saying Wednesday it only needed “some” further evidence inflation and employment were on track toward its goals in order to hike. Bullion for immediate delivery rose as much as 0.8 percent to $1,306.87 an ounce and traded at $1,302.38 at 2:36 p.m. in Singapore, according to Bloomberg generic pricing. On Wednesday, prices rallied to a four-week high of $1,308.02 as global equities fell for the sixth time in seven days. Silver has benefited from investors’ Trump angst too. The metal seen as gold’s cheaper, more volatile cousin advanced on Thursday for the ninth time in 10 days. Spot prices rose 0.2 percent at $18.5145 an ounce, after gaining to $18.7415 on Wednesday, the highest level since Oct. 4. Democrat Clinton has seen her odds of a victory falter after a probe into an unauthorized e-mail server was reopened. Election uncertainty may drive precious metals higher as investors flee to havens, Jodie Gunzberg, global head of commodities and real assets at S&P Dow Jones Indices, said in a note. Assets in exchange-traded funds backed by gold have expanded every month this year apart from a dip in April. Holdings were at 2,043 tons on Wednesday, up 40 percent in 2016, data compiled by Bloomberg show. In China, bullion of 99.99 percent purity added as much as 0.8 percent to 284.78 yuan a gram ($1,310.42 an ounce) on the Shanghai Gold Exchange, the highest since Oct. 10. On global markets, platinum increased 0.3 percent, while palladium climbed 0.4 percent.